North Carolina has not adopted or made available a definition of college and career readiness. North Carolina’s state policy allows students to earn dual credit for academic or CTE postsecondary courses taken at their high school, a postsecondary institution, or virtually. All public postsecondary institutions in the state are required to accept dual-enrollment credits (ECS, 2015). The College of the Albemarle, Gateway to College National Network, North Carolina Early College Initiative, North Carolina New Schools Project, and SECME, Inc. have partnered with institutions of higher education to provide 76 Early College High School programs as part of the Early College High School Initiative (ECHSI). North Carolina has adopted the National Career Clusters Framework and has modified the 16 Career Clusters. The 16 National Career Clusters have been grouped by the North Carolina Department of Public Instruction into seven program areas. 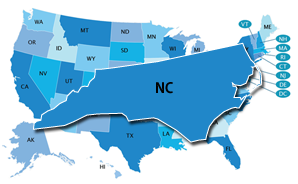 North Carolina does not have a statewide system for career exploration or career plans at the K–12 level. The above graduation requirements, known as the Future-Ready Core, were first implemented for ninth graders entering in 2012–13. North Carolina’s state-specific Early Warning System is called the Early Warning Reporting System. Early Warning System data are reported by singular student, school, district, or specific grouping. Administration, student support staff, and teachers can access the data, at the discretion of local district administration.